Animal totems are something I was interested in but never really explored. I always sort of felt that you needed to be a big nature lover to work with animal totems and if you know me, you know that me and nature do not get along. I’m allergic to just about everything that grows and every animal. All fur, feathers, dander, down, all of it. 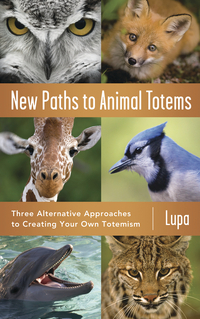 However, Lupa’s new book “New Paths to Animal Totems: Three Alternative Approaches to Creating Your Totemism” really opened my eyes. Lupa explains how you don’t have to be tied to the Native American model that so many books and websites tend to favor. She offers three alternative models to discerning your totems: correspondences, bioregional, and archetypal. In correspondences Lupa discusses discovering your totem/totems using the directions, the Chinese or Western Zodiac, the Tarot and more. Bioregionalism is finding your totems not from within arbitrary boundaries such as state lines but instead from a place defined by natural phenomena such as waterways and geographic formations. Last is archetypal which is more psychological than other options. It matches our internal impulses and instincts to what we know of nonhuman animals, creating a personalized map of both the internal self and the world we inhabit. Lupa offers exercises, meditations, and examples for all of these so the seeker has a companion working with them along their path. She also discusses the option of combining these totemic paths. Additionally, Lupa discusses ways to interact with, honor, and assist your totem animal. There’s a guided meditation for helping find your totem animal. My favorite extra is a list of animal nonprofits. “New Paths to Animal Totems” is a great book for anyone looking for a new perspective, or for someone new like me. I thought that someone housebound like myself couldn’t have a relationship with a totem animal, but Lupa’s writing opened my eyes. Ideally yes, being out in nature is great. However many people have totem animals that aren’t found in nature where they live, so being outside doesn’t effect the relationship one way or the other. That’s a pretty big leap from one book. Just think what “New Paths to Animals” might teach you.